A Life Drawing Workshop for artists. The Deal Life Drawing Group is a nationally accredited group in Deal, Kent open to all professionals, teachers, full and part-time students together with experienced amateurs. Everyone is welcome. Two-hour group sessions are held weekly on Tuesday mornings at 10 am and Wednesday evenings at 7 pm. A four hour session is held on the last Saturday of each month from 10am until 2pm. We always have the same pose for 2 hours then another for the second half. Sometimes we keep the same pose for the 4 hours depending on the consensus. See below for specific dates, locations and charges. No formal membership is required. 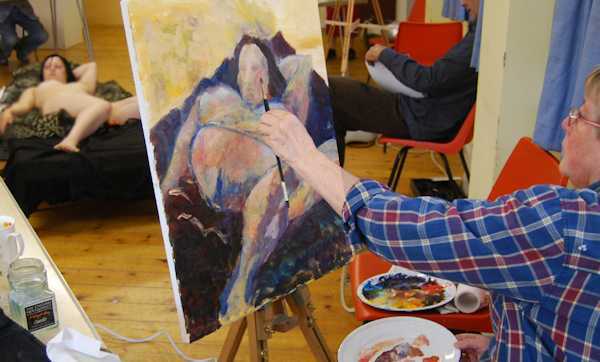 The group has a nucleus of regular members but also operates a drop-in system where members can refresh or develop their Life Drawing skills when time allows. Our 2017 annual dinner was held at The Courtyard in Deal. One of the aims of the dinner is to bring everyone together - the Tuesday, Wednesday and Saturday groups - with as many of our models as we can. See here for pictures of our previous annual dinners, 2010, 2011, 2012, 2013. 2014, 2015 and 2017. We held our 3rd exhibition in October 2017 at the Astor. Our 2nd group exhibition was held during November 2015. Both were very well attended and a few members sold pictures. Tuesday sessions are at 10 am until 12 noon at the Sea Scout Hall in Marine Road, Deal. There is free parking along Marine Road. Wednesday sessions are at 7 pm until 9pm at the Astor. There is a car park next to the Astor free after 5pm. Saturday sessions: usually on the last Saturday of the month, are at St Andrews Church Hall, Deal. The church hall lies behind the church and there is free parking in the churchyard. They run from 10am until 2pm. See here for map and addresses for all the venues. Charges per session: Tuesdays-£6. Wednesdays-£8. Saturday (10am-2pm)-£11. Saturday morning (10am-12 noon)-£6 and Saturday afternoon (12 noon-2pm)-£6. For any further information please contact Paul Warrick by email at paul@paulwarrick.com or by phone, Whatsapp or text 07763-590922.